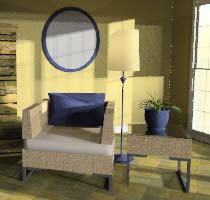 This Tutorial, basic room model and some of the components were built by Jorge López. Jorge López is an architect who has been teaching at Kirkwood Community College in Cedar Rapids,Iowa since 1991. This IRender nXt tutorial was created for his students in the CAD SketchUp class. 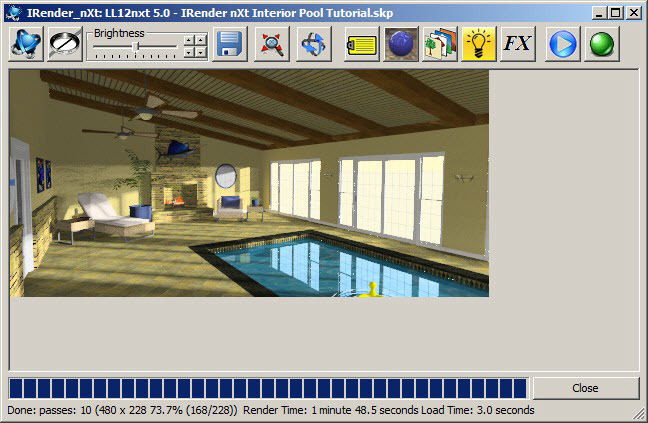 This tutorial assumes that both SketchUp== [www.sketchup.com] and IRender nXt [www.renderplus.com] are installed on your computer (a free trial is available for 30 days). It also assumes you have a working knowledge of the SketchUp program. 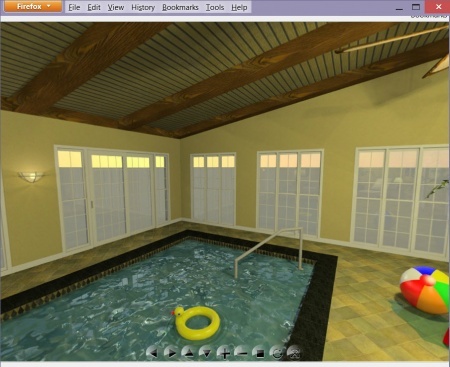 IRender nXt is a plug-in for the SketchUp program that creates high quality renderings. This tutorial covers some of the tips and techniques found in blogs and the IRender nXt video tutorial website. It is by no means complete, but a good start. Refer to the IRender nXt website for additional tutorials and explanations. 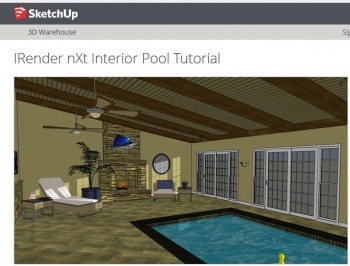 Download the Interior Pool Tutorial SketchUp file from the 3D Warehouse. It is a model of an indoor residential pool with five scene tabs at the top. Click each tab to get an overall sense for the layout of the room. Some scenes will be used later to create a rendered video. Click on the scene tab labeled (inside) to begin working with IRender nXt. IRender nXt can create a pretty good rendering without adjusting any settings.== Click the Render button on the IRender nXt Toolbar. A dialog box appears. 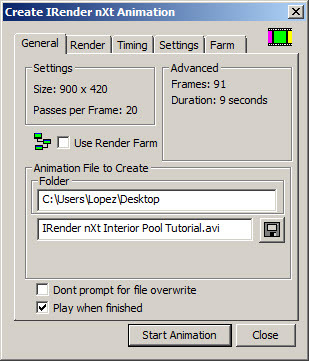 Use this dialog box to tell the IRender nXt program how you want to have the scene rendered. Switch the default settings to match figure 3. Click the radio button for Interior With Sun. 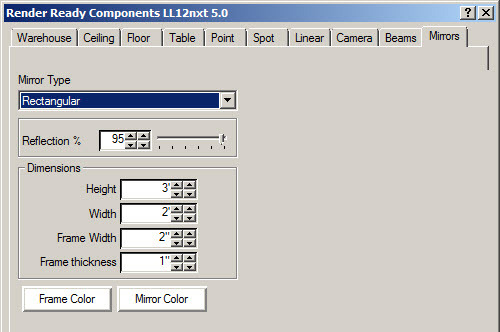 Set the X value to 480 and click the box to Use SketchUp aspect ratio. The Y value may be different depending on the size of your SketchUp window. The X and Y values determine the size of the rendered image. Set the Passes to 10. The number of passes determines the quality of the final output. For initial test runs, use a low number, because a higher number will take longer to render. The default is 20, but 10 passes is usually enough to determine initial settings, especially for smaller size renders. Set it higher for the final render. You can also set the Rendering Quality to Quick Draft. This produces a rough image which takes a short time to render. 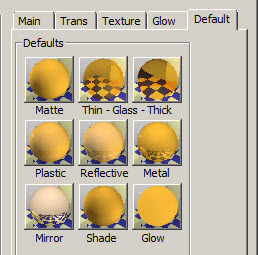 Use this setting when looking at a model with complex light settings and materials. For this first run, use the High setting. Change the setting to Quick Draft, if your computer slows down too much as you work through this tutorial. Always use the High setting and set Passes to 20 when rendering the final image. As the program begins the render, a small preview window appears. When the passes are done, you can save the image to disk in a variety of formats, which are described later in this tutorial. This first run is a pretty good rendering. Notice the transparent elements and reflections. These effects are created automatically by the IRender nXt program when transparent materials are selected in the creation of a SketchUp file, as they were in this Pool Tutorial. This render was completed in a relatively short amount of time. Adding material properties and light sources will extend the rendering time. Looking at the initial rendering, it appears that the area by the chaise lounge could use some light. Add a table lamp on the side table by the chaise. Click the Load Render Ready Component button on the IRender nXt Toolbar. Click the Warehouse tab. Here, you can find premade components. Click the Desk option under Lights. Scroll down in the Display Window to see the Traditional fixture. Adjust the settings as shown in Figure 7. 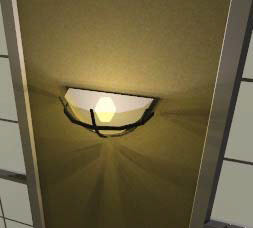 Set the Lighting Intensity to 20 watts – this fixture has multiple bulbs, so each bulb will be 20 watts. 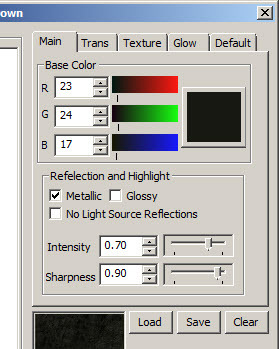 Click on the Color button to set the color value for the light. 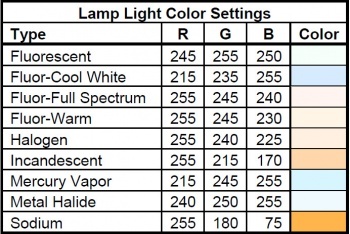 These settings will vary depending on the type of light you are using. Figure 6 lists some useful settings for different types of bulbs. These values are derived from a variety of sources. They are not absolute, but useful as a starting point. They can be adjusted later as needed. Set the Lighting Channel to 2. Lighting channels act like dimmer switches in the rendering. More detail is provided later in this tutorial. Click Create/Place Lamp and place the component on the table by the chaise. Click on the Render button on the IRender nXt Toolbar to see the result (Figure 8). Notice the glow on the shade and the light cast on the wall. The area is no longer dark. 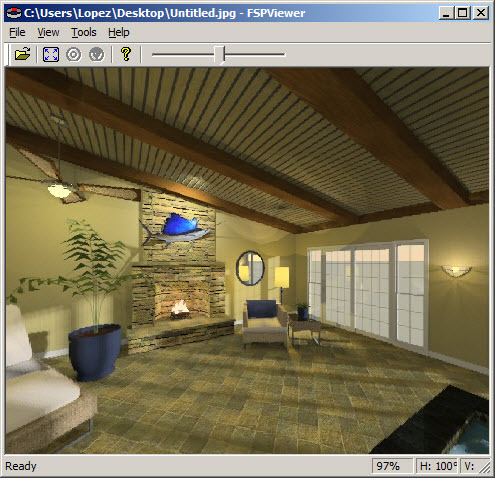 IRender nXt is a useful program for determining which areas in a space need additional light. Click the Load Render Ready Component button on the IRender nXt Toolbar. Select the Floor tab for a floor lamp. 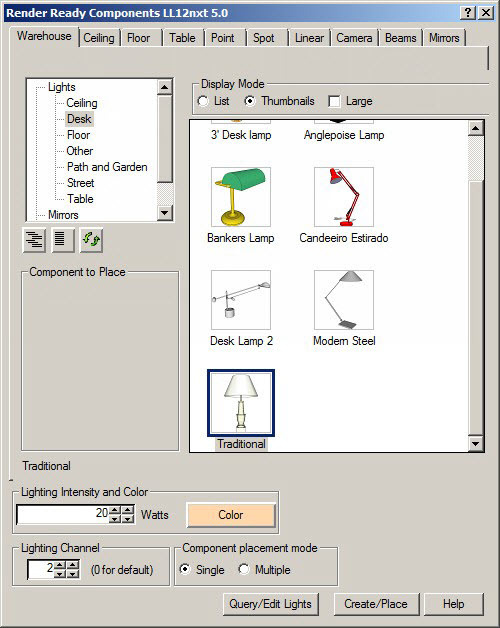 Create your own style of lamp or adjust the settings as noted below and shown in Figure 9 to match this tutorial. Make the floor lamp 5’ tall with a 1’6” shade. Set the shade diameter to 1’2” and the base to 1’. Set the Intensity to 60 watts. Set the Lighting Channel to 2 to match the channel of the traditional lamp. 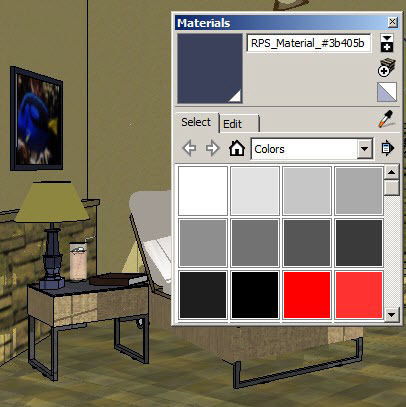 You can change the color of the table lamp to match the floor lamp by using the Paint Bucket Tool in SketchUp. Use the Sample button (which looks like an eyedropper) to select the colors from the shade and base of the floor lamp. Then, paint those values, one at a time, onto the shade and base of the table lamp. 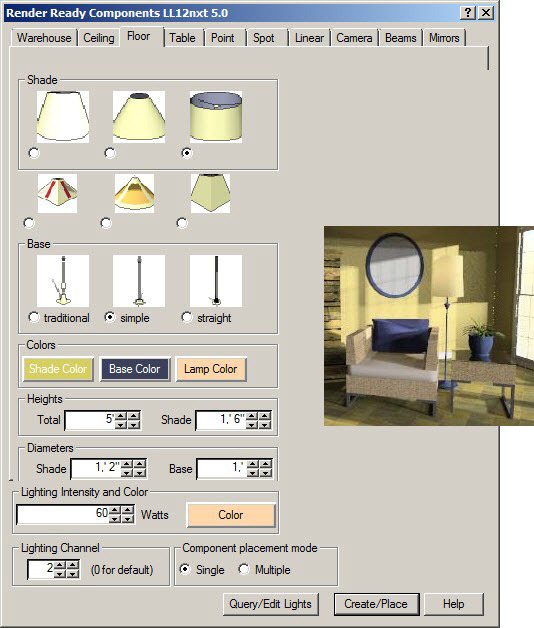 Make sure to double click on the component you wish to color, otherwise the whole lamp and shade will be colored instead of the individual item. 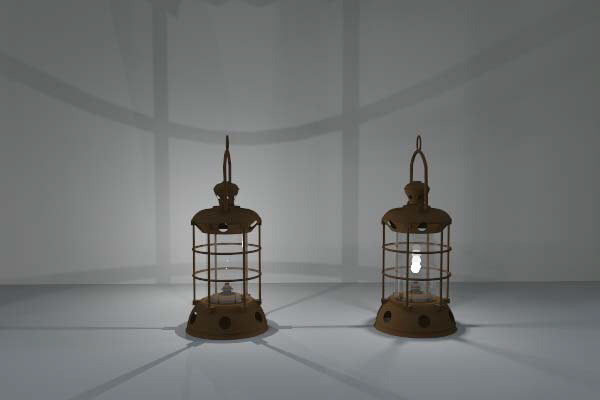 Now, both lamps appear as part of the same set. 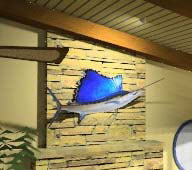 Over the fireplace, add a different type of light fixture, a spot light, in order to light the swordfish. Once again select Load Render Ready Component. Click the Spot tab. 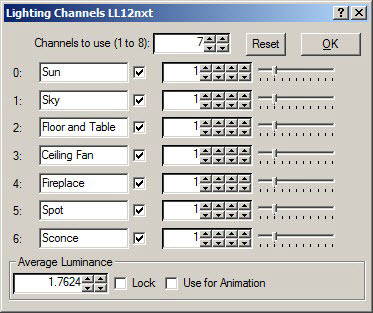 Keep all of the default settings, except set the Lighting Intensity to 60 watts and the Lighting Channel to 5 (refer to Figure 12). 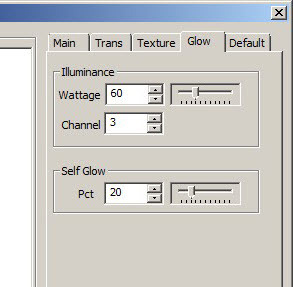 Note: Creating lighting fixtures on separate Lighting Channels will allow you to individually control their intensity in the final rendering. You will even be able to turn off each fixture. The Lengths setting is used to denote the size of the lamp and the length of the cone. Use the default settings for this tutorial. 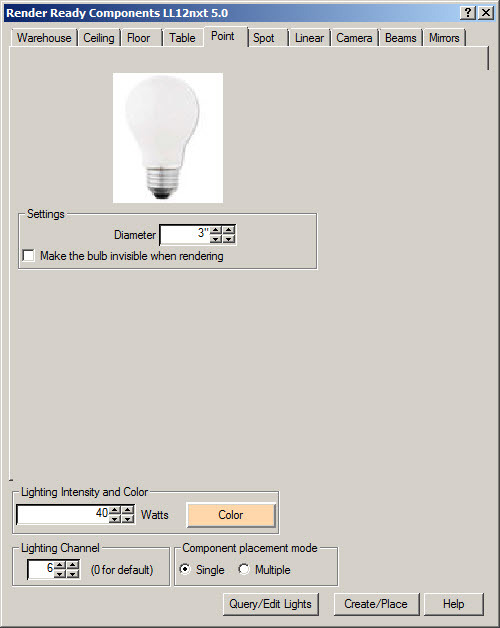 The other settings determine how the bulb will appear in the SketchUp model. Keep the default settings for Glue to surfaces and Show beam in SketchUp, which will allow you to position the light. You can select the Show Beam when rendering setting to denote a foggy or a smoke-filled room where the beam of light is visible. For this tutorial, keep this unselected. The Make the bulb invisible when rendering setting is useful when you have a light fixture component already in place and just want to have the beam of light. Since the actual lamp created will be the final fixture, let’s keep this option unchecked. After clicking the Create Lamp button a cone shaped lamp appears which represents our light. Position the lamp on the ceiling between the first two wood beams. 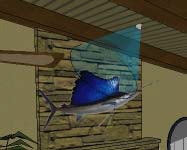 Then, use the Rotate Tool in SketchUp to angle the cone of light to face the swordfish as shown in Figure 13. If you do not want the cone to appear in the SketchUp model, you can place it in a separate layer using SketchUp’s Layer Manager and turn the layer off. Keep the cone of light visible in this tutorial. 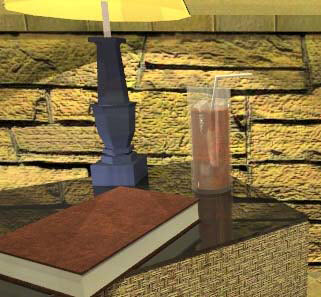 Figure 14 shows the rendered lamp. Another technique to add lighting is by creating a light source in a component. 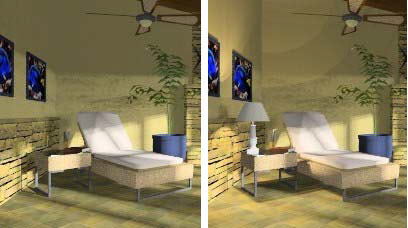 The previous techniques use light sources created by IRender nXt. This technique allows you to light any component that you download from the 3D Warehouse. 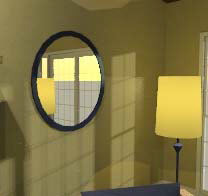 The wall sconce components located between the sliding glass doors were downloaded from the 3D Warehouse. Zoom in on one of them. Double click on the sconce component to make adjustments. Any changes made to one sconce will affect all of the sconces. Click on the Load Render Ready Component button and select the Point tab. Use the default 3” setting for the bulb size. The diameter of the bulb determines how sharp a shadow it will cast. The larger the bulb diameter, the softer the light it will cast. 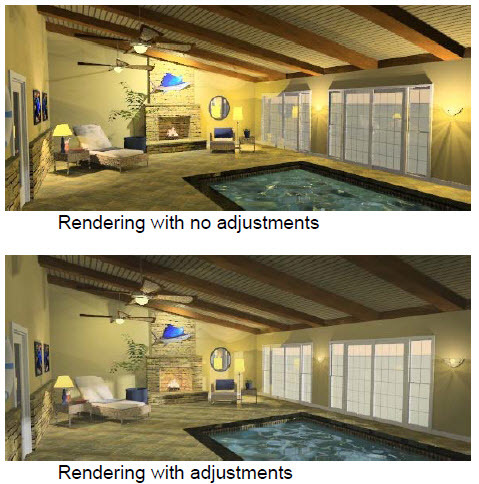 Figure 15 from the IRender forums shows the effects of changing the bulb size. The image on the left was set to a bulb size of .05. The one on the right, 2”. Set the light color for the incandescent bulb. Place the bulb on Lighting Channel 6. Figure 17 depicts the rendered sconce. The bulb is segmented to reduce the file size of the component. The segmented shape will not be noticeable in the final rendering, because it will be far in the background of the rendering. If this light fixture were to appear in the foreground, it would be best to make the bulb more spherical. Given its current placement, this shape is adequate. The shadows on the wall will become less defined as you increase the number of passes in the final rendering. The last technique you can use to add lighting to a scene is to edit a material so that it appears to emit light. Zoom in on one of the ceiling fans. Click the Select and Edit Materials button. Click the pick button (eyedropper) and then click on the center surface of the fan. 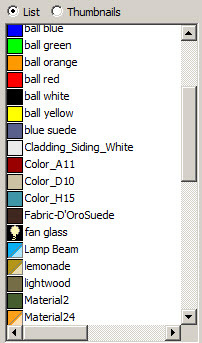 Fan glass appears in the material window, which is the name of the material of the SketchUp model. Click the Edit button. An Edit Material dialog box appears. Click the different tabs. Notice the different options. Click the Glow tab. Set the Wattage, Channel and Self Glow as in Figure 20. After clicking OK, the main window reappears. Notice the light bulb symbol graphic next to the fan glass material. This denotes that the program recognizes this material as a light emitter. Any item that has this material applied to its surface will emit light and glow in a rendering. It is best to use a unique name for these materials, so that only surfaces with these specifically named materials will light up. If you want to use this material setting often, you can save the changes to a file in the previous step. Then, you can load the file using a different material to create a similar effect. Use this same technique to make the fire light up. Zoom in on the fire in the fireplace. Click the Select and Edit Materials button. There are two different materials used for the flames (FlameOrange and FlameYellow). Click OK to set the changes, and exit the material editor. Click the SketchUp tab (inside) to restore the view to the original scene. Render the scene. The fire now emits light. Leave the render window open. This same technique can be used to “light up” a TV or computer screen. 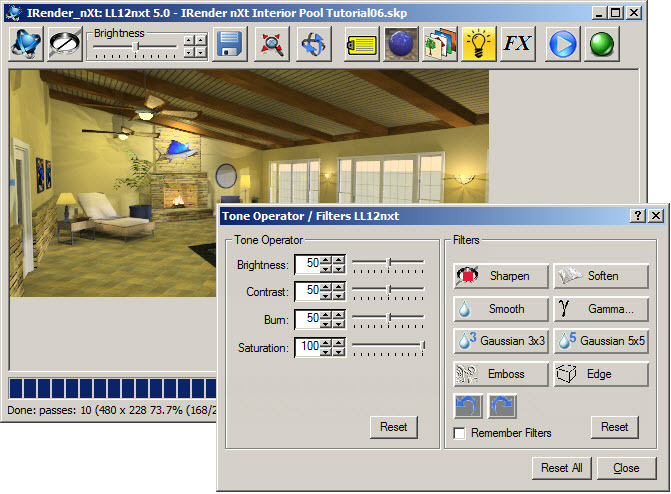 Click on the material used for the TV or computer screen and adjust the settings until it emits the appropriate amount of light in the rendering. Compare Figure 21 with Figure 4. Notice the overall even lighting, especially the light coming in from the windows. 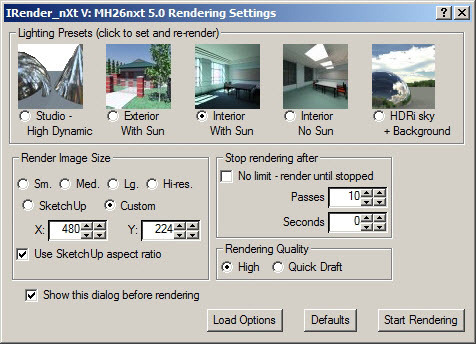 IRender nXt automatically adjusts light intensity when it renders, producing an effect similar to a camera. In Figure 4, the amount of light was so low that it washed out the mullions and glass detail. Figure 21 has more balanced lighting, which does not wash out the light coming from outside. You can even see through the glass. You will often need to re-render a scene as you work out the lighting. 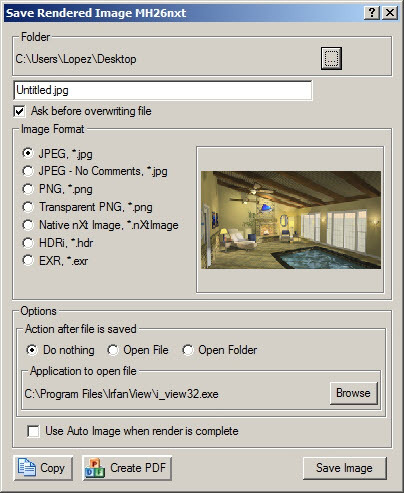 When re-rendering, the dialog box in Figure 22 may appear. Click Import Selected Changes so that the adjusted settings remain the same. Otherwise, any settings you adjust will revert to the defaults. Click the Lighting Channels button in the Render preview window to see how they affect the render. Click the boxes to turn off or turn on the different lights. Use the slider to make the lights dimmer or brighter. Channels 0 and 1 are set to Sun and Sky by default. Turning them off produces a night scene. Dimming them simulates a cloudy day, and making them brighter simulates a bright day. Click Reset to bring them back to 1. 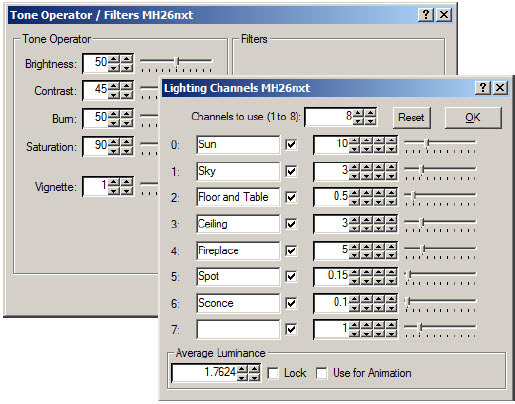 Click in each box and rename the different channels, associating each channel with a specific light (Figure 24). You will return to this dialog box after you make changes to the materials. In addition to changing the light intensity, you can fine tune a variety of other items to create a better final rendering. Click the Brightness slider to adjust overall brightness. Click the Image Filters button to set many other filter options. By editing more materials in the room, you can add more realistic qualities to the final rendering. For example, the surface of the pool is transparent, which is a default property. You can make it appear more like water by adjusting the material settings. Click the Select and Edit Materials button. Click the pick button (eyedropper) and then click the water in the pool (Water_Pool_Light). Click the Edit button to reveal a window of settings options. Click the Texture tab. The options in this tab represent pre-defined properties. Click Rubble. Set Bump Scale to 99 and Strength to 1. This will simulate a gentle ripple on the surface of the pool. 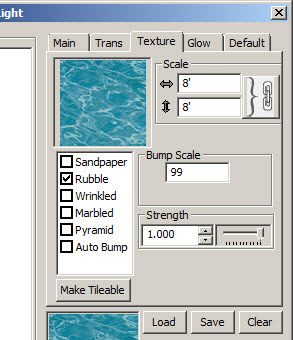 You can also use the Rubble setting for large bodies of water. Set the Bump Scale to 10 and the Strength to 0.1. 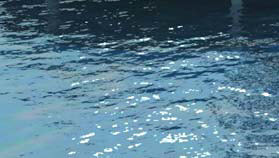 This will create a more rippled surface similar to a large body of water. 26. You can edit the tile floor material to add more dimensionality to the final rendering. In their current state, they appear flat, as if they had been painted on the floor. Click the Select and Edit Materials button. Click the pick button (eyedropper) and then click the floor tile (Tile_Ceramic_Multi). Click the Edit button to reveal a window with settings options. 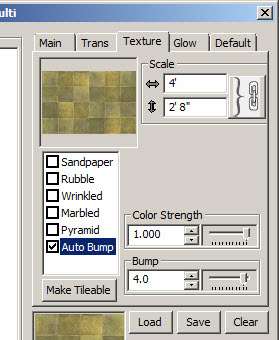 Click the Texture tab and select Auto Bump. Make the changes illustrated in Figure 28. These settings will give some texture to the tile floor. Notice the difference as the tile is rendered. Repeat the above steps for all of the materials representing the tiles around the edge of the pool, the stonework around the fireplace, and the weave on the furniture. These items will now appear with even more texture and dimensionality in the rendering. Occasionally, Auto Bump needs to be set to a negative number. This usually is necessary with dark grout and light tiles. Zoom up to the ceiling. Click the Select and Edit Materials button. Then, click the ceiling planks (lightwood). Click the Edit button, click the Texture tab, and select Auto Bump. Set the Bump to -4.0. With some materials you will need to try a variety of settings in order to get the desired effect. You can combine other settings with Auto Bump. For example, to add a slight shine to the dark tile border around the pool edge, click the Select and Edit Materials button. 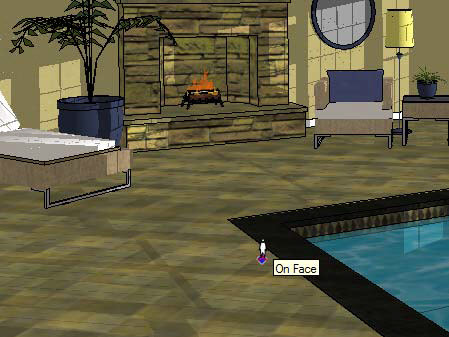 Click the pick button (eyedropper) and then click the dark floor tile (Tile_Ceramic_Brown). Click the Edit button to reveal a window of settings options. Click the Default tab (Figure 29). The options represent pre-defined properties. Click Metal. This selection does not actually make the tile a metal surface. Instead, it makes the quality of light hitting the tile seem as if it were hitting a metal surface. This setting will produce a bit of shine on the material without making it too reflective. Once you click the Metal selection, the window will automatically shift to the Main tab. Adjust the settings to match Figure 30. This will give some shine to the dark-edged tile as if it were a bit polished. Notice the tile now appears to have some shine when you render it. Click on the scene tab labeled pool. The following steps will make the beach ball and inner tube appear as if they are made of plastic when rendered. Zoom up to the beach ball. Click the Select and Edit Materials button. 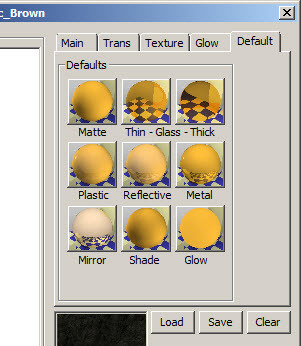 Click the pick button (eyedropper) and then click the yellow color of the beach ball (ball yellow). Click the Edit button. Click the Default tab. The options represented are pre-defined properties. Click Plastic. Keep the default settings when the window switches to the Main tab. Click OK. The yellow material on the inner tube was created using the same material, so it will also exhibit the plastic properties when you render the image. Repeat the above steps for each of the different colors on the ball. Repeat the previous steps to apply the Metal default setting to the pool grab bar (Metal_Brushed) to represent metal. Accept the default settings. Click OK. Figure 31 shows the cumulative effects of the previous material changes. Compare it with the earlier renderings. Each change makes the scene appear more “real.” Also note that these changes extend the time required for the image to render. Click on the scene tab labeled (corner). Zoom up to the mirror behind the chair. Click the Select and Edit Materials button. Click the pick button (eyedropper) and then click the gray color of the mirror’s surface (Mirror). Click the Edit button. the default settings in the Main tab, which should automatically appear. Look at the rendered result in Figure 32. You can also create rectangular mirrors by using the Load Render Ready Component button on the IRender nXt Toolbar (Figure 33). Click the Mirrors tab to see the variety of options. This tool will allow you to create a rectangular mirror and adjust the settings to create a reflective surface. Click on the scene tab labeled seating. Zoom up to the beverage glass on the table by the chaise lounge. In initial renderings, the contents appear flat and unlike a fluid. If you do not intend to render a close-up of this scene, there is no need to adjust the settings for the glass. Refer to previous renderings; did you notice problems with the way the glass rendered? To render a close-up, you will likely want to make some adjustments. Click the Select and Edit Materials button. Click the pick button (eyedropper) and then click the glass surface (Glass). Click the Edit button. Click the Default tab. Click Thin-Glass. 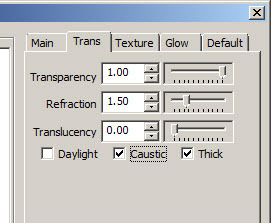 Click the Caustic button after the window automatically shifts to the Trans tab (Figure 34). Click OK. These caustic settings refer to the quality of light as it passes, bending and refracting, through transparent materials. Click the pick button (eyedropper) and then click the fluid material inside the glass (iced tea). Click the Edit button. Click the Default tab. Click Glass-Thick. Click the Caustic button after the window automatically shifts to the Trans tab. Adjust the other settings to match Figure 35. Click OK. The thin or thick option affects how items like the drinking straw and the background appear when they are refracted through the beverage. The above changes make the glass and iced tea materials no longer visible in the SketchUp model. They appear fully transparent. The IRender nXt program will render these materials as if they were clear glass. 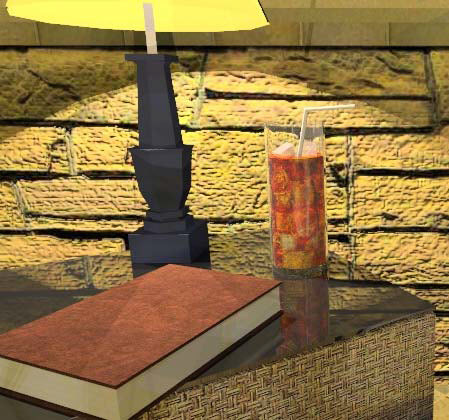 To make the liquid appear as iced tea as well as having the glass appear somewhat visible in the SketchUp model, adjust the material settings using the Paint Bucket Tool in SketchUp. Set the opacity of the glass to 10 and the iced tea to 80. Even with these changes, the IRender nXt program will continue to render the glass appropriately. Notice how, in Figure 36, the caustics setting causes the stone visible through the glass to appear refracted by the glass. These changes have also affected the time required to render the image. When you have adjusted the settings and the rendering is complete. Click on the Save Rendered Image to Disk button. A dialog box will appear with options to save the image in a variety of file types. Most of these options are self-explanatory. Usually, saving the rendering as a jpg is a useful image option. The unique file type for this software is the Native nXt Image. By selecting this file type, you will keep the tone, lighting channel and all of the other adjustments you made. Saving the rendering in this format will also let you open it again in the future using the Edit nXt Image button without re-rendering the entire scene. Then, you can modify the lighting and tone settings once again. 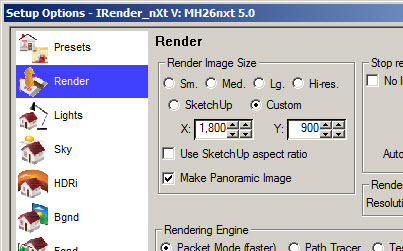 When you save the SketchUp file, all of the IRender nXt settings and adjustments will also be saved. You can easily create rendered panoramas using IRender nXt. Panoramas provide an overall feel of the whole space. In order to create a panorama, first locate a spot near the middle of the space, avoiding locations that would create an awkward or unrealistic viewpoint. For example, you cannot stand on water, so selecting a spot over the pool would be an awkward viewpoint. Similarly, placing the viewpoint in front of a mirror would be disorienting, because the software will not provide your reflection in the final rendering. 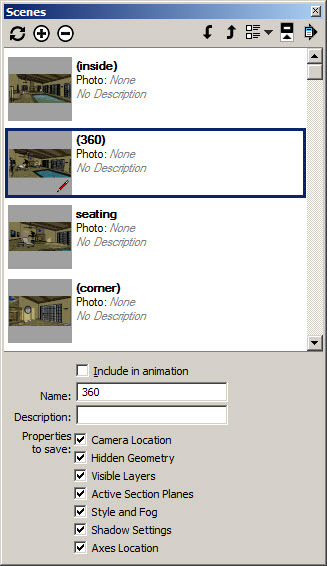 In SketchUp, use the Position Camera Tool in the Camera Toolbar group. 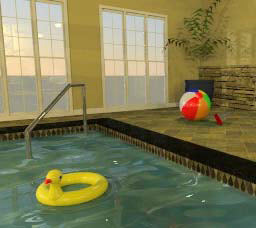 Place the cursor by the edge of the pool in a position similar to Figure 38. Click on Camera>Field of View to include more of the scene. The value control box in the bottom corner changes. 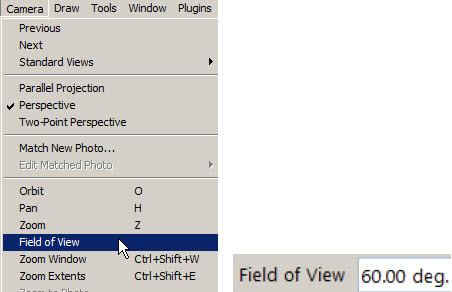 Type 60 deg to change the default field of view to one simulating the field of view as seen through a wide angle camera lens. You will not be able to click inside the value control box; simply type the numbers using the keyboard and the number in the box will change. The perspective of the scene will appear slightly distorted and stretched out. Use the Zoom Tool and Pan Tool until the perspective appears to be correct; use your own judgment to decide which looks best. Refer to Figure 39. Make a new scene of this view, name it 360, and deselect the Include in animation checkbox. Deselecting the animation checkbox ensures that this scene will not appear in the animation that you will create later in this tutorial. The settings are now part of the scene, and you can adjust them further, if necessary. Click the Render button as before. When the dialog box opens, click the Load Options button. Under the setup options, click Render Option. Click Make Panoramic Image and custom size. Type 1800 for the X dimension. The Y dimension will be half that size. The larger the image, the more detailed the final panorama will render. Click the green button at the bottom to create the panorama rendering. This can take a while to complete. When complete, the result will be an image like Figure 40. Before saving it, adjust the Light Channels and Image Filter settings as needed. Save the file as a jpg. This version of FSPViewer is free for commercial and non-commercial use outside Italy. To use it in Italy, you will need to contact the author via the FSP Viewer website. This Panorama is being viewed with a Field of View of 60 degrees. That means that the area seen on the screen at any time is about 1/6th (60/360) of the total resolution of the screen. So a higher resolution rendering is required to get quality results. On a 1280 pixel screen, you would want at least 1/2 or that (640 pixels) in the view, so would need a resoltuion of at least 6 x 640 (about 3,600 pixels). Twice that (7,200 pixels) would be even better. Under Tools>Options in the FSP Viewer, set the FOV to 60 to match the scene settings. You may need to close and reopen the program for these settings to take effect. Open the 360 degree jpg file and use the mouse to change the view. You also can easily create a rendered animation using IRender nXt. The program uses the scenes created in SketchUp to make the animation. Make sure that the scenes are in the proper order and are running smoothly when using View>Animation>Play in SketchUp. Then, click the Create Animation button on the IRender nXt Toolbar. 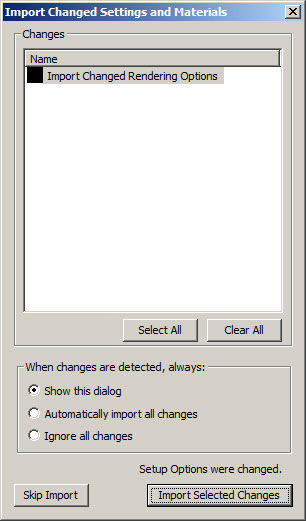 The Create Animation dialog box appears. Use most of the default settings for this tutorial. In the General tab, select where to save the animation. It is best to save it to the hard drive. You should also give the file a name. It will render the animation as an avi file. On the Render tab, you can select the resolution size. The larger the resolution, the longer it will take for the software to render. The file size will also be larger. Use Sm for this initial render. 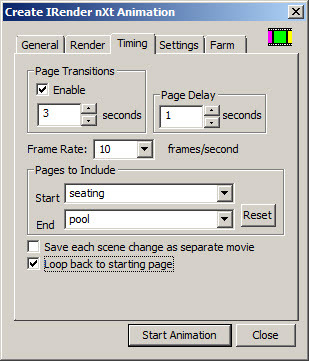 On the Timing tab, you have the option to select any page delays, the frame rate, or whether or not the animation will return to the starting scene. 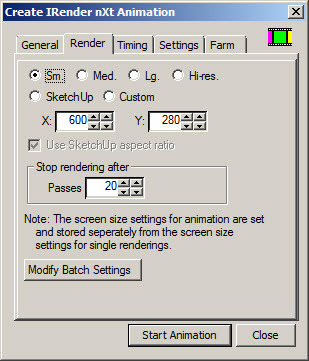 These settings are similar to the SketchUp animation settings. When you check the loop back to starting page option, the IRender nXt program will create a final scene tab named RPS Loop Back in the SketchUp model. In the Settings tab, click the Video Compression button. Click Full Frames (uncompressed) as the video compression. Many other types of video codecs appear in the list. 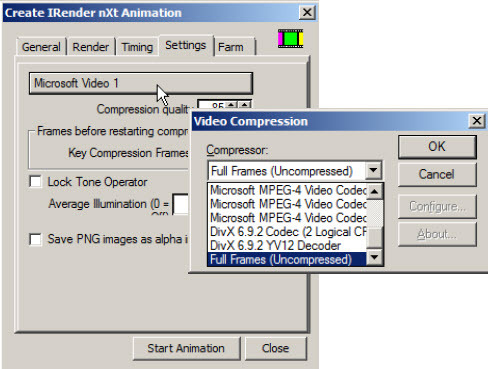 Verify which video codecs you have installed on your computer and use the appropriate settings to create the final animation. Leave the default settings for the other tabs. Start the animation. Rendering will take a significant amount of time. Use Windows Media player or another video player program to view the final animation. This tutorial covered many techniques in the IRender nXt program. Adjust the settings to make the renderings appear as you would like them. Refer to the IRender nXt website for additional tutorials and explanations. The website also provides options to get help from the IRender nXt Community. A few components were downloaded from the 3D Warehouse. These models were made by bigredku, dert, Google, Render Plus Systems, José Antonio Rocha, Darrell Smith and Trenton GB. Some models from the 3D Warehouse were modified for this tutorial. 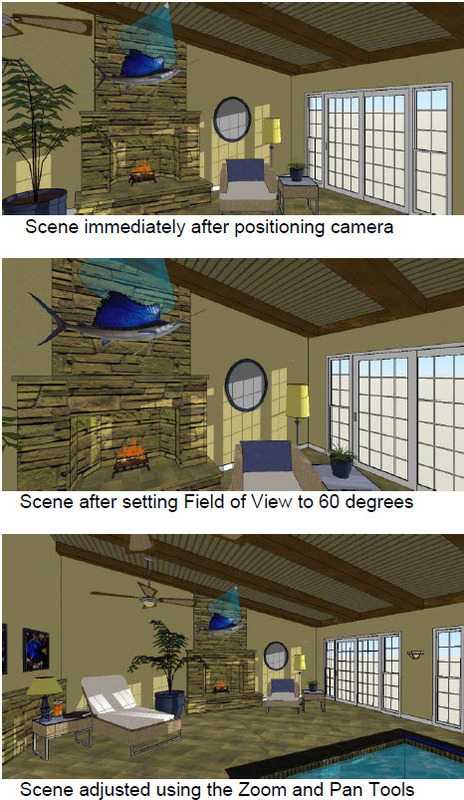 The materials used in the model were either the standard ones that came installed with SketchUp or modified by Jorge López, except the Blue tang fish image used in the picture frames. It is an image by Tewy, found on Wikipedia. The creator of this tutorial has attempted to credit all of the images and models in this model. If your image/model is used in this tutorial and is not credited, please contact Jorge López, who will update the credits section.